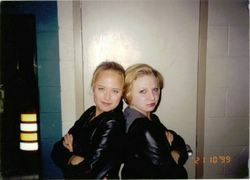 young kat and audra circa 1999. this is where it all began... LOOK how little we were! I bet - no I KNOW we thought we were UBER cool! this is a pic of us in the dorm fresham year. i think it looks more like an 8th grade pic than a COLLEGE pic, but we are, in fact, 18 years of age in this picture. note the stolen construction barrel in the left hand side of the picture! i think it is of note that we did not actually steal that barrel ourselves, did we? crap now i can't remember if allison put it in her jeep or if one of the downstairs boys brought it to us...one too many drunk dinners is to blame i suppose! you do look like CHILDREN. ha! You look like J-Lo in that pic, Kat.